There are so many times these keto jalapeno poppers are the perfect thing. They are a creamy party snack, healthy snack, and fulfill so many cravings. It seems like staying on Keto when there is a party or tons of snacks around is just plain difficult. Why are all the “good” snacks filled with carbs? So I decided I need to create something I can munch on during these times of temptation. I wanted something that is finger food, salty, and packed with flavor (no boring keto food). What I ended up creating was so popular I almost didn’t get to eat any myself! Note to self: make twice as much next time. These jalapeno poppers are addicting! They are filled with two types of cheese and a bit of garlic powder. Scroll down to read the recipe. I’m going to share a few things first that will help you make the best poppers ever. How many net carbs are in this recipe? There are quite a few different types of bacon. 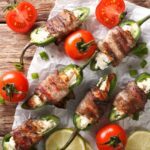 So which is best for wrapping jalapeno poppers? I prefer regular sliced bacon without added sugar. The thick cut bacon tends to overpower the jalapenos. Wrap a slice of bacon around each jalapeno. Put the jalapeno poppers in the air fryer in a single layer. Set air fryer to 390 degrees. Can you use just cheddar cheese in jalapeno poppers? I used a mixture of cream cheese and shredded cheese because I just loved how creamy it made them. They taste decadent and feel like I’m cheating when I’m not. If you don’t have cream cheese or want to use a little less fat in your recipe, these can be made with only cheddar cheese as well. You will have to use more cheddar cheese than the recipe calls for. 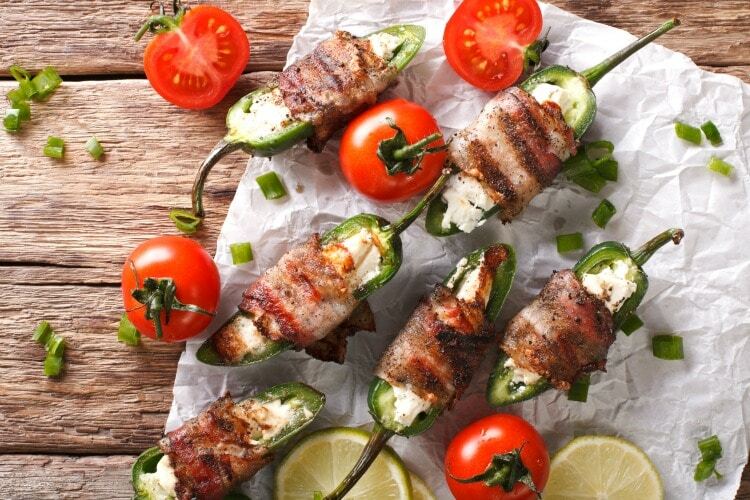 Just fill up the jalapeno slices full of cheese, then wrap them in bacon. These ingredients also make a fantastic dip! Chop up the jalapenos, add them to the cream cheese and cheddar cheese mixture with the garlic powder. Fry the bacon and chop them into little bits. Heat all of it in a slow cooker for a few hours. Yum!! Serve with raw peppers for dipping. 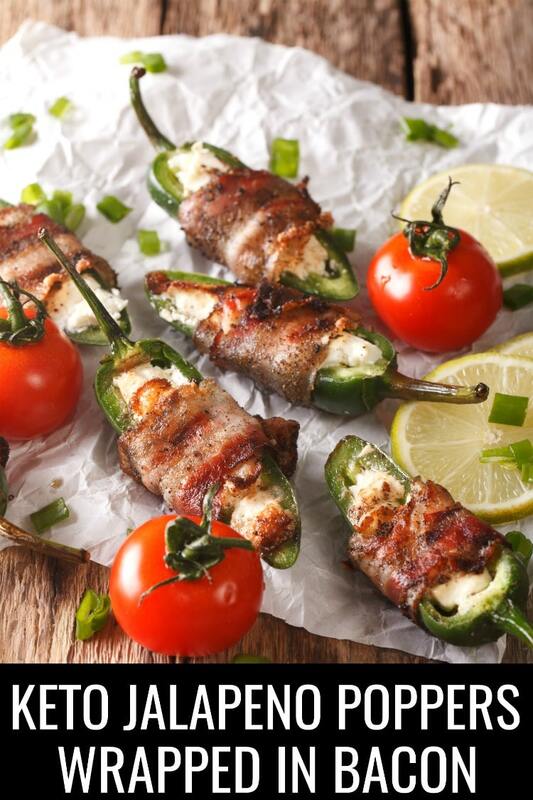 Here’s my recipe for bacon wrapped jalapeno poppers! If you make them, let me know. Tag me on Instagram @LiveLoveTX. I’d love to see them! Preheat oven to 400 degrees. Line a baking sheet with foil or a silicone baking mat. Mix cheeses together until well blended and fill each jalapeño half with cheese. Then, take half a slice of bacon and wrap around jalapeño half. Place jalapeños on prepared baking sheet and cook until bacon is crispy, about 20 minutes. If bacon is not crispy enough you can always place under the broiler for 5 minutes to your desired crispiness is achieved. If you’re going to grill these instead, make sure to use toothpicks to keep the bacon in place. These poppers are so totally crave worthy! SO easy and delicious! I’ll need to make a double batch next time, too!